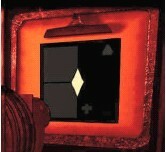 Gameplay: Chemicus is a first person point and click game. It is a scientific adventure so collect everything that you can. Knowledge of chemistry is very helpful while playing this game but don't let it deter you if you have none. You can load the full game on to your hard drive so there is no need to keep switching discs as the game progresses. Enter the room and look around. Then go to the bureau on the left wall. Open the top drawer and take out the computer and a piece of paper. After reading the paper, put it back. Open drawers in this order: Cu -top drawer, H - bottom right, S - top right, Ti - top left, He - bottom left and Cu - top drawer. If done correctly, the bureau should swing out. Climb down the rope by clicking on it. Lower Lab and Hall: Turn around and pick up red cabbage. Then turn and go down hall to 1st corridor on the right. Move forward through the door and to the desk on the right wall. Pick up the lemon, lime potash, and the hydrochloric acid. Go back out of the room. After walking out the door, turn to your left. Place the lemon on the zinc and copper electrodes. You now have light. Go back into the lab and go to the desk on the right. Turn to your right and go to cabinet. Open the cabinet and take the cola out of the cabinet. Go to the other end of the room and get the rusty key out of the sink. At stove, put cabbage in pot, turn on heat and then off. Take indicator solution. Go back to the desk. Put cola in the tumbler and then add the rusty key. Remove key from cola to get key. Use cleaned key to open the safe under the desk. Remove the amulet and paper. Put the paper on the hotplate and turn the hotplate on. Pick up the paper and read it. Go to the table in the middle of the room. Place cabbage indicator solution in the tank. Add lime potash 2x. The tank should be blue and number 7 should be on the indicator. Now push 5 of the 6 buttons around the table. All should be depressed except the button located at 5:00. Now leave the room and walk to the end of the hall, follow the light beam. Place the amulet on the vision that you see. Cave and Stairs: Go up the first flight of stairs, turn right and go down the next set of stairs to the rusty valve. Open the rusty valve. You hear water flowing. Now climb the stairs all the way up to the temple. Temple: Go to the door to exit and look to your left. Pick up the distilled water and transporter module Cl. Open and walk out the door. Move forward and to the right. Pick up a lemon. Return to the Temple. Once you enter the Temple, turn around and open the door. Notice the hydraulic weight on the right of the door. Place lemon there. The door will close on its own after a minute. Now pick up the Lemon juice. Walk over and pour the lemon juice on the calcified waterspout. Leave the Temple and walk up the path to the next building. Control Room: Walk forward to center console turn left. Zoom in on the ground and pick up knowledge chip and fuel cell aggregate. Temple: Go back to the Temple now and put the fuel cell on the sealing valve on the left side of the room. Go back to the control room. Control room: At the center of the desk, flip the switch on the left side of console. Turn left and push the bottom blue triangle. Head out the door. At the bottom of the stairs, turn to your left and go down into the transporter room. Get inside transporter and place module Cl on the panel and push (far right below F). Pool Area: Walk all the way to the room at the other end of the pools. Enter the room and look right. Collect the module H and knowledge chip from the table. Move forward to the pole and look up. Collect the broken prism. Go back to the transporter and install module-H in to the chart. Statue Area: Walk forward and climb the stairs. At the top, turn to your left and walk forward to the statue. Collect knowledge chip and module Pb. Go back to transporter and install module Pb. Pb Area: At area Pb, pick up the knowledge chip and module chips: Ni Cu Zn Ag. Go up the stairs and press the green button. Ride the elevator up and collect the spiral edged rod off the dresser to the right of the door and go back down to transporter. Install Ni module and off we go. Ag Area: Zoom in on the dial at right of the elevator and push Ag. In this room, collect module C N O. From the drawer, take a keycard and blank paper. From the closet, take fixing salt solution. Ni Area: Leave the room, turn around and zoom in on dial again. This time push Ni. Enter the room, turn right and forward. Open the locker and collect sulfuric acid and copper(2)oxide. Take the nail out of the door. Open the top drawer and take glass beads and copper wire. Turn to the right and look on the shelf. Read the repair logbook (take note how to make sparkler - thermite mixture, power and gas cutting out). Pick up knowledge chip. Move over to the desk and collect iron shavings, aluminum kernels and module Fe. Zoom in on battery charger & pick up bike spoke. Move to the door on zoom in on dial shift it to Ni Ni. Walk back over to the desk and zoom in on battery charger again. Put sulfuric acid, copper2oxide, nail, & copper wire in the flask. Turn on the power to battery charger. Remove the nail and go back to the dial on the door. Open the compartment to the dial and add the nail at Ni Cu. Now close the compartment turn the dial back to Ni Cu and leave the room. Zn Area: Out in the hallway, turn the dial to Zn and enter the room. Walk to the desk and collect nitric acid, barium nitrate and module Al Si. Read lab journal. Leave the room and go back to the transporter. Insert module Mn Fe. Steelworks: Walk all the way across the walkway to the ladder at the other end. Climb the ladder. Once at the conveyor belt, push the button on the upper right and collect metal pipe. Turn conveyor belt on again, let it go till you see Ore coming out and then stop the conveyor belt. Collect ore from conveyor belt. Go back down the ladder and half way across the walkway to a ladder on the right. Climb down the ladder and walk over to pile of coke. Collect coke, mold and module S. Go back to the transporter. Enter C N O. Lab And Big Nose Rock: Exit transporter, walk up path to the left and enter lab. Once inside look right and set temp switch to the maximum of 270 degrees. Go to the desk at the end of the room and collect starch, carbon dioxide and solution for color chromatography. Take the UV lamp and cork from chest. Use the solution on the paper and note the mix. Head back to transport and push Al Si. Garden: Walk around the greenhouse to the pile of sand. Collect sand and wood splint off of grill. Place wood splint in the grill and then take it back out. You now have a glowing wood stick. Go back and stand in front of the greenhouse. Turn and look at the temp gauge. Lovely roses! Pick a rose. Now look down and pick up knowledge chip. Head back to the transport and insert module S. But push Ti. Temple: Put the rosebud in distillation chamber. Walk over to the warm water, open the valve, go back to the chamber and pick up Rose Oil. Cave: Go down the stairs to the cave. Put the cork in the leaky stalactite. Then set carbon dioxide tube on stalactite. Look down and collect the stalactite chips. Head back out to the control room. On your way, grab another lemon. Control room: Once in the Control room, turn to your right and click just to the left of the thick metal pipe. Notice an empty place, place the thin metal pipe in that space. Now the left water tank is almost empty, make it so that the right one is almost empty. Leave and go back to transporter and go to Zn. Zn area: Make sure the dial in the hall is set to Zn then enter the room. Inside the room turn dial to Zn Zn. Go to Bunsen burner and place stalactite in dish. Turn on Bunsen burner, turn it off and collect quicklime. Next put the following things in the dish next to the Bunsen burner - starch, barium nitrate, iron shavings, aluminum and water. Add bike spoke. Collect the sparkler. Set dial next to door back to Cu and transport to Sn Pb. Sn Pb area: At the empty reactor, add water and quicklime. Open both valves - So2, And Ho2. Now open the bottom valve and plaster drains out. Place broken prism in plaster. Then pick up prism and mold. Get in transporter and go to Cu. Cu area: In the hall, zoom in one the goofy looking thing on the right by the dial. Put copper2oxide in the left cup and place a black bead on the outer ring. Push the red button. Collect copper1oxide from the right dish. Return to transport push Al Si. Garden: Follow the path down and around till you are in front of a tree. Zoom in on the tree. Remove the plant and put mold under pot. Put ore, aluminum, sparkler and glowing piece of wood. Now collect the cast iron. Head to Steelworks Mn Fe. Steelworks: Walk half way across walkway. On your left are 3 compartments. Add cast iron to Fe, quicklime on right and coke on left. Now turn left and move once. On your left, climb down another ladder. Walk over to another ladder and climb it. At the console, push the left button. After cutscene, push the right button. Go back down the ladder and get the steel gear shaft. Go back to transport and push Sn. Sn area: Look underneath platform for transporter. Place steel gear shaft and the spiral edge rod. Get back in transport and push Sn again. Doctor's Office: Go to the x-ray machine on the left side of the room. Collect the red die. Now go to cabinet hanging on the back wall and collect knowledge chip, soda , gelatin , sodium chloride and potash. Go to the cabinet on the right side of the room and collect cater oil, dextrose, tin tumbler and silver bar. Go back over to the x ray machine and place the silver bar inside. Turn it on by pulling left lever and pushing right button. Now back away and look at the projection on the wall. Now remove the silver bar and leave. Go to transport and push S.
Volcano: Leave the transporter, ride the elevator up and walk out the doors at the top. Once outside, look close at the buckets in the bucket closest to you. Add water in the other bucket. Add potash, sand, copper1oxide(red) and soda. Crank the lever on the wheel (bucket lowers) and crank the same lever again (bucket rises). Now pull the handle next to the pails and collect the red beads. While you are in this frame, look down and collect the snow. Now all is done, go back to transporter and push Cu. Cu area: In the hall, set dial to Zn and enter room. Set dial in room to Zn Zn. Place the tin tumbler and lead die in bowl. Turn on Bunsen burner and remove solder. Now walk over to empty aquarium, place silver bar in it and fill with nitric acid. Collect arm, solution and empty aquarium. Set room dial back to Cu and head for transport push Cl. Pool Area: Walk to the room at the other end of the pools and enter. Once inside, look to your right and put the snow and sodium chloride in storage compartment. Place plaster mold and water in frig. Now pull the lever in the center and collect the ice prism from the frig. Now move forward once and look to your left. Move the tile to expose the U-Pipe. Add sodium chloride to U-pipe. Move forward to the golden statue, look in the well and add water (a picture materializes). On to the pole in the center of the room, switch the lever to H2O. At the top of the pole, add the ice prism. Now on your left, slide the ball down to the statues hand. Look at the door behind the pole, you can now enter it. From the locker in the room, collect pineapple-pear-perfume, safety key and knowledge chip. At the far left end of the room, collect the swimsuit. Go out and head for the control room. Control Room: Go to the control board on the left and push the upper arrow so that it is orange. Be sure all lights on the center counsel are green now. Head to transporter and punch C N O. 190--133--103--078--020--. On your left, unlock the door with the safety key and collect wooden template and sample of every chemical. Now move forward and to your right, there is a distillation chamber. Add Pineapple - Pear- Perfume to distillation chamber. Move forward to the desk. On the right is a reflux condenser. Add isopentanol and acetic acid to the reflux condenser. Turn on water flow and hit the heat switch. Collect the Banana Aroma. Now add Castor oil and lemon juice, turn on water flow and hit the heat switch. Collect the poly resin and knowledge chip. Now move to the center of the room. To your right, collect the ethyl (flask #4) and the Pear aroma (flask#1). Move back to the desk and look at the center of the table. There are 5 test tubes hanging on the wall: First tube -Rose Oil, Second tube - Ethyl, Third tube -Pear aroma and fourth tube - Banana aroma. Now pour water in the empty beaker. The squeeze tubes on the table are in order from left to right: 1ml, 2ml, 5ml, 10ml and 50ml. You must fill each one with water and weigh it on the scale. After doing this, add as follows to the Erlenmeyer Flask: Tube 2 (1 - 50mls and 4 -10mls), next Tube 1 (1 - 1ml), next Tube 4 (1 - 5mls) and last Tube3 (2 - 2mls). Now collect Sister Rias Perfume. If you mess up dump solution into beaker and start over. Make sure before you release squeeze tubes over flask you have an open hand icon. Good luck! Now that you made the perfume head to the Big Nose Rock. Place your newly made perfume under the nose of the rock and enter. Head down the tunnel on the right. Once in the room, place the left golden arm on the pedestal and move over to the wall chart. Here you will need to place your beads. I can't do pictures so bare with me here. The 2nd bead is red and then the center of each branch is blue. There are 10 all together and the rest are white. Now the wall drops when beads are placed correctly. Walk to the pedestal in the next room and collect right golden arm. Now turn around and collect the diamond off the wall behind you( green area). Head back to the Garden Al Si. Garden: Walk around to the front of the greenhouse and look at the temp gauge. Look even closer and see there is a drain pipe sticking out from under the bushes. Attach the carbon dioxide tube to it and look back at the temp gauge - notice the temp rises to 30. Now walk around to the side of the greenhouse and face it. Wait for the roof to open up. Now look closely, use diamond to cut glass. Collect glass and diamond. Go to the transport and head to Doctor's office Sn Pb. Doctor's Office: At the office, head straight back to the furnace and add solder. Now close the door and flip the switch next to the temp gauge on the left. Once the oven heats up, open the spout on the right and collect solder template. Head off to Cl Br l. (If 1st pool is full, go to Ti in control room and switch the 2 water pumps back so the left one is almost empty). Pool Area: If pool is empty, climb down the ladder, turn around and enter the door on the right side of the ladder. Follow passage way to the other end and climb the ladder. Go to the middle landing and click on the machine to your right. Open the compartment and take the refillable lamp. Go down to the first landing and walk over to the gas pumps. Fill the lamp with Ne gas only. Now go back to the second landing, replace the light in the compartment and turn on the spectrometer (mostly reds). Now remove the light and head to the third landing . At the top of the stairs turn left and push the red button. After the cutscene leave the room and go to the Temple at Ti. Temple: In the Temple place the aquarium in the warm water well on the left side of the room. Now add silver nitrate solution, dextrose and pane of glass. Now collect the metallized pane of glass. Now head to transport and push Ni. Hall: In the hall, push Ni on the dial. Enter the room and set the room dial to Ni Ni. Move over to glass cutting machine. Place keycard in slot, diamond on tension device and metallized glass in work area. Collect the glass template. Switch room dial back to Cu. Photo lab: Out in the hall switch dial to Ag (photo lab). Once inside, place gas light in the photo lamp slot on the back wall. Go and switch room dial to Ag but only if you see a green light (if not back track you missed something). Go to projector and place metallized glass template, solder template and wooden template on projector. Place UV lamp in the lamp holder on side of projector. Now turn button on the back to the left position. Now push the 4 buttons on the top until you get a picture with a white rhombus shape in the middle, gray left pointing arrow on the top left, a gray plus sign on the top right and the bottom left and right sides are a gray color. Now switch projector to 0. Go over to the desk and in the left pan place sodium chloride , gelatin & water. At middle pan, add silver nitrate solution. To right pan, add fixing solution. Place blank card in left tray and then middle tray. Go back to the projector and hang the sheet on the projector wall and turn projector to timer. Take card with rhombus shape on it back to the desk and put it in the right tray. Take your new keycard. Turn the dial back to Cu. Now head to transport H.
Statue: Walk to the statue and place the right golden arm on the statue. Now raise the arm and then walk over to the computer terminal by the door. After the cutscene, take the decoder of of the computer and go back to transport Cl. Pool Area: Go back down to the pump room in the pool and walk up to the third level. Walk over to the door on the back wall and place rhombus keycard in slot. Walk out the door and look to your right. Turn the valve and continue across the skywalk to the other building. Enter the building and walk around the room to to stairs. Go up the stairs move forward once and turn to the left. Push the buttons so the left pipe makes a backward L and the bottom left pipe makes upside down L. The straight bar is horizontal, the top right pipe is an upside down L and the bottom right pipe is laying on its back open side facing right. When they are set right, a skylight will open. Go back down the stairs at the bottom of the stairs move forward 2x and look close at the rip in the balloon on the right. Add the poly resin to tear and the swimsuit to the poly resin. Turn around and pull the lever to fill the balloon. Now walk to and go inside the gondola. Look to your right and place Decoder crystal on navigation tool bar. Enjoy the ride. Tower: In the tower, go to the computer terminal at the center of the room and collect white powder. Turn around and go to the elevator. Once inside, turn around and push button for analysis lab. Disposal Hall: Exit elevator, then turn back towards the elevator and push arrow to send elevator up. Walk forward, place keycard in machine and select Organic Solvent Halo-Free. Walk around the room until you find a receptacle with a red light on. Dispose of Banana pear rose perfume, methanol, dimethyl ether, 2-propanol, hexanol and pineapple pear perfume. Now go back to the center, select glass breakage and repeat process - getting rid of red, white and blue beads and the broken glass prism. Repeat process to waste water and dispose of distilled water and lemon juice. Repeat process to Bio waste and dispose of plant, lemon and sand. Repeat process to inorganic solid waste and dispose of quicklime, heavy metals and copper 2 oxide. Go back and remove keycard and push button to bring the elevator back down. Now go to Analysis Lab. Analysis Lab: At the lab, take a left out of the elevator. Walk to the tube like machine (Analysis center). Enter the keycard and push the left top button and the bottom right. Then open the 2 doors on the machine and put white powder inside. Close the doors and wait for analysis to be completed. Analysis=183.21 g/mol. Take the knowledge chip and remove keycard and head up to the computer center. Computer Center: In the computer center go to the computer on the right side of the room. Place the keycard in the computer. When the screen lights up, enter C9 H13 N1 O3 P0. Once this is done, push ok, then remove the keycard and go back down to the analysis lab to the analysis center machine. Analysis Lab: Put the keycard in. Push the middle left button and the right top right button. Now open doors again and place white powder in them. After the analysis is complete, push ok, then remove your keycard and head back up to the computer center again. Computer Center: Now go to the computer on the left side of the room and place the keycard in the machine. The left column should read 1-1-1 the middle column should read 3-1 and the right column should read 1 now enter ok. Remove the keycard and go back to the analysis lab one more time. Analysis Lab: Go to the same machine and enter your keycard. Push the bottom left button and the middle right one. Put more white powder in the machine, wait for the analysis, then push ok and get your keycard. Synthesis lab: This time you are going to go to the Synthesis Lab. Step off the elevator and go to your left. Go to the machine with 3 balls and 3 lights on it. Start clicking the marks on the dial from left to right until the ball moves over the light that is lit up. Copy down the number you see. Now pull the lever on the right and repeat the process for the green and red lights. You should have Blue=IV, Green=IX and Red=I. Now turn to your right twice and put the keycard in that machine. Now remember what the model looked like on the last computer screen you looked at. You need to replicate it, starting with the CH model first and using the OH model last. Once the machine tells you that it made your hormone you may remove the keycard. Walk over to the other side of the room and pick up the model that you just created and head up to the computer center. Once there look for the break in the power cord leading to the center computer (it is just to the right of the center computer). Now put the keycard in the center computer and enter the code. 194- Sit back and watch what you accomplished.